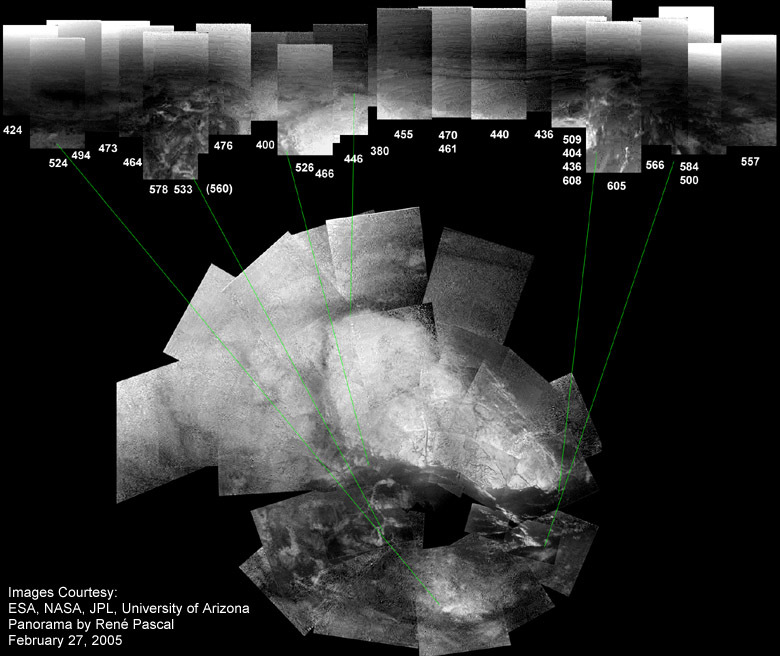 The above Panorama (top) shows what should be the most distant details of the surface of Titan imaged in useful quality by the Huygens Lander. I used DISR Side Looking Imager (SLI) frames that were obtained very early, beginning with frame number 380. Prior to stitching and other contrast adjusting procedures, the frames were corrected using what I call an "atmospheric brighness gradient flatfield". The flatfield was calculated again using very early images by the DISR SLI imager. This flatfield contains (and consequently corrects) defects of the DISR SLI optics and CCD but, unlike the MRI flatfields, the SLI flatfield predominantly contains a mediated atmospheric brightness gradient of Titans atmosphere because of its horizontal viewing angle. For this reason I also call it an "apocryphal" flatfield. The removal of the atmospheric brighness gradient in this panorama uncovers some feeble distant details, but make shure that any interpretation of large scale photometric distributions of Titan's landscape always comprises a view at the uncorrected (see below) frames! Although frames from lower altitudes show a stronger atmospheric brightness gradient, all frames were treated with the same flatfield. One detail that may be of special interest are two conspicious, dark lines in the north, that are running parallel to each other. These details should also be large enough to become visible on Cassini high resolution ISS Images of the Huygens landing site. A correlation of details in the panorama with the same details visible in the large surface coverage mosaic (bottom) is also shown. The version with the individual frames corrected with the "apocryphal" flatfield, as mentioned above, exhibits a lot of distant feeble landscape details that are otherwise lost in the brightness gradient from hazy atmosphere to dark surface. For any interpretation on landscape features in terms of albedo properties, it is important to have a critical look at this uncorrected version.